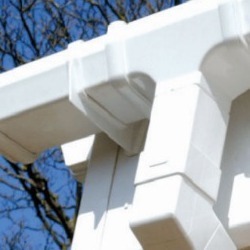 Gutter Supplies Square Guttering is manufactured by FloPlast, the market leader in the UK. The Square Gutter system is manufactured to BS EN12200 and carries a 20 year performance and 10 year colour* guarantee. Square gutters have become more popular over the last ten years. The flow rate is slightly higher than that of half round gutters, and the system can be fitted with either round or square downpipe. If you are looking to match up with existing square guttering, perhaps on a neighbouring roof, you should establish the make of that system (it will be written on one, if not all, of the fittings), and check the compatibility chart on our technical page - not all square systems are interchangeable. Our products are compatible with most systems including Hepworth, Brett Martin and Hunter. Floplast Square Gutter capacity varies between 1.7 litres per second (fixed level with the outlet at one end) and 3.95 litres per second (fixed at 1:350 with a central outlet). Surprisingly this is almost double that flow rate of Half Round Guttering, and more than ample to cope with the flow from a standard pitch, domestic roof. If you have a very steep pitched roof, or perhaps a much larger than average surface area, we would recommend that you consider fitting either our Deepflow Gutters or Ogee Gutters. The size of the downpipe is irrelevant in terms of the system capacity – provided that they are kept free of leaves and debris our downpipes will always have a far greater flow capacity than the gutters that they serve. 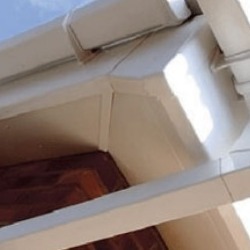 Square guttering connects to 65mm Square Downpipe as standard, but it can easily be connected to 68mm round downpipe if required by using the RDS2 adaptor. 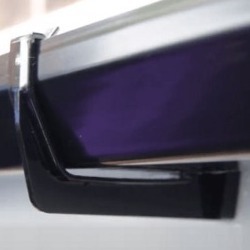 For tips and videos on square plastic gutter installation, compatibility and maintenance please visit our Guides and Tips Section.